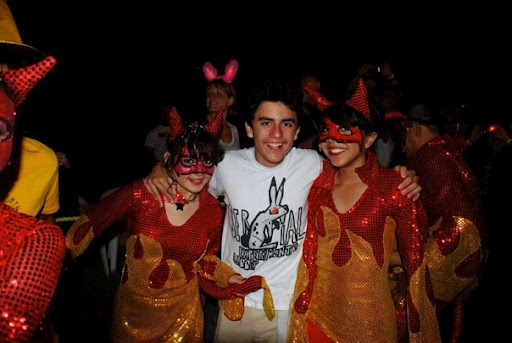 Carnavál de Mazatlán: Why We Love It | ¡VidaMaz! 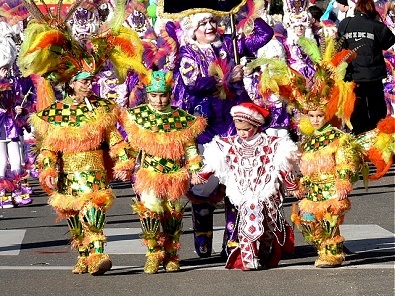 Mardi Gras is celebrated worldwide: from Russia, Croatia and Turkey to Angola, Cape Verde and the Seychelles; from Italy, Germany and the Netherlands, throughout North and South America and the Caribbean. My favorite Carnavál memory is being in a very small pueblo in the Sacred Valley of Perú and being covered with florid blue, pink and purple powder, then squirted with water (it stained everything I was wearing), then passing around a communal giant beer bottle that gave me dysentary. My husband warned me not to imbibe, but I chose to partake of the festivities. Don’t regret it, either. Rio’s Mardi Gras is the most famous. Some day I’ll get there, and samba with the masses. Mardi Gras in New Orleans is also well known; we’ve all seen the photos of the bare breasts flashing. 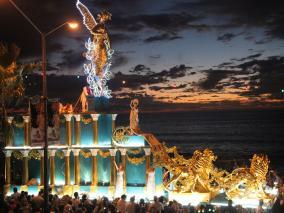 But Mazatlán’s Carnavál holds its own. It’s family-friendly, diverse and a whole lot of fun. If you haven’t yet joined us, be sure not to miss the fun. It is held, as with most Carnavales worldwide, the five days prior to Ash Wednesday (Thursday through Tuesday nights). 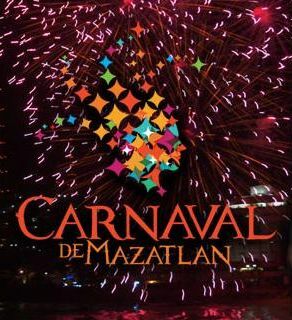 Carnavál has been celebrated in Mazatlán since the mid to late 1800s, though the first officially planned Carnavál de Mazatlán was in 1898. Back then, they celebrated with a Rey Feo (Ugly King) rather than today’s Rey de la Alegría (King of Joy), but for generations there have been Carnavál and Juegos Florales (Floral Games) Queens, and back as far as 1900 there was a ball for the kids. This community festival has a long, long history as a family event. 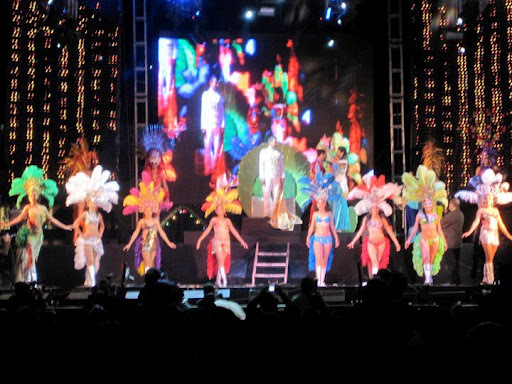 Carnavál de Mazatlán is noteworthy for its long association with our regional banda and tambora music, as well as with fine arts events (painting, literature, classical music). 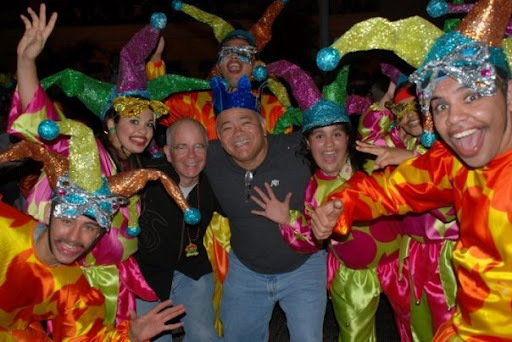 What do I love about Mazatlán’s Carnavál? First, I absolutely love that it is a community event. The month before Carnavál, you can walk in many neighborhoods around town and see dance groups or marching bands practicing. As the weeks go by and Carnavál gets closer, these rehearsals become costumed dress rehearsals. I love the decorations! Every year we get to see colored lights strung along the malecón, all the way from Olas Altas to Valentino’s. Interspersed among the lights, on the light poles, are banners reflecting the year’s Carnavál theme. Best of all, for me, are the monigotes: colorful giant statues that are made from papier mâché and erected at strategic spots up and down the boardwalk, to help build excitement. Every year the monigotes are different, and reflect that year’s Carnival theme. Thirdly, I absolutely love the street party down at Olas Altas. It is one big “human wave” of revelers and merry makers. The King of Joy coronation, show and concert on Thursday night is one of the best nights. 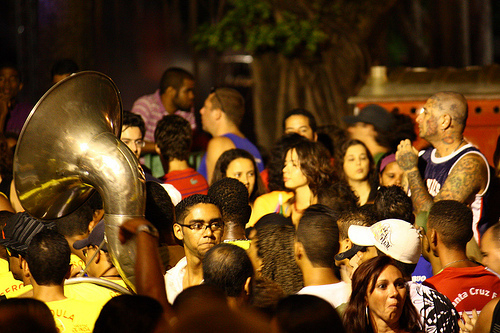 A well-known banda plays, for free, in the street on the Carnavál grounds. It is awesome! The party zone is open every night. There are maybe eight stages, each with a different kind of music playing: banda, ranchera, salsa, mambo, rock, reggaetón. Hawkers sell masks, eyelashes, hats, noisemakers, face painting, games, drinks and food. You will, literally, be dancing in the streets. Everyone has fun! It is a big crowd scene, so if you hate crowds do not purposefully go there. We love it. Don’t like the music? Grab your beer or margarita and shimmy down the street to another stage. A few years ago, they did things a little differently when Banda El Recodo was King. 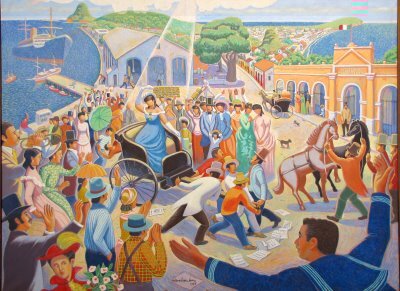 They held the coronation in the land off the street dedicated to their founder, Don Cruz Lizárraga. You can read about that night here. Let’s see, the fact that we have two, yes, TWO, huge fireworks shows during Carnavál is also wonderful. 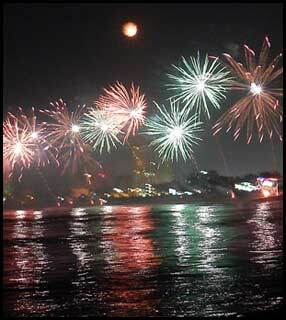 Everyone knows about Saturday night, when they burn the “bad humor” and fight the French in the Combate Naval fireworks. But on Monday night they also usually have a “Festival of Lights” along the malecón, which last year for the first time was accompanied by a mini-parade of lighted floats (not the main parade floats). Fifth, it is awesome to have FOUR coronations, meaning four major stars or groups, performing in concert. Three of those concerts take place right behind my house. Who needs a ticket when I can sit on my terrace and listen? No, the performances are definitely worth the ticket price: major concert, fireworks, acrobatics and dance, music, pomp and circumstance of the coronation…. The coronations are truly cool events. And the King Coronation in Olas Altas on Thursday is free (except for the token admission to the party zone). Sixth, I really love learning every year about artists and writers who I often don’t know. You see, every year there is a prize given for literature as well as for painting. And every year, it seems, I’m introduced to some terrific new-to-me talent. Most incredible and wonderful to me are the Carros Alegóricos, the floats, of the two main Carnavál parades. The first one, on Sunday, usually starts in Olas Altas in daylight and heads north (though this year it’s announced to be starting at the Fisherman’s Monument), passing our house and arriving at Valentino’s in the dark. This parade is so popular that many people stake out their spots the night before. There is an entire parade village along the Avenue with families watching TV’s powered by generators and eating hot breakfasts in their lounge chairs. Also, enterprising folks erect bleachers everywhere they can and rent chairs for parade watching. All the businesses along the avenue advertise parade viewing space at premium prices. Can a parade really be that good you ask? YES! The floats are oh-so-gorgeous! The queens and princesses, kings and princes, shine! 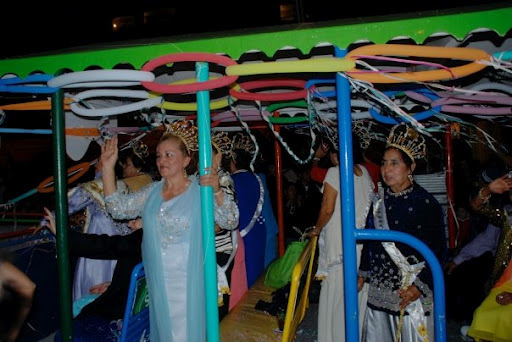 In 2010, we did a blog post about Maestro Rigo Lewis, long-time creator and overseer of the floats. Click here to read. And the dancers! Young and old alike dance all the way, four miles or so, and most of them enjoy every single second! It is non-stop live music, oohs and ahs, and laughter. Do not miss the parades! The second one, on Tuesday, starts south of Valentino’s and heads down to Olas Altas. The second parade is not usually as good as the first, I feel. The floats are a bit tired, as are the dancers. But it’s still wonderful. 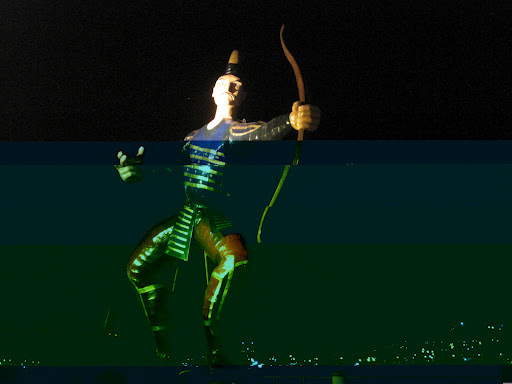 The floats at night glow, and appear as they were designed to appear. Those are the photos I like best. But, they are hard to take, since the parade is moving. You might want to catch one of the parades in daylight and the other in night light, if you want to photograph. I especially urge you to visit the second parade before it starts, as they are setting up, as the kids are getting their makeup put on and dressing in their costumes. It is a wonderful time to chat with some of the dancers, and to get some terrific photo ops. The queen and king are usually there, as well, and happy to pose with you. I blogged about that as well, and there’s a movie to go with it. Eighth, remember that between parades they tend to park the floats in the Gran Plaza. Since they just built the new theater this year, I’m not sure that’s still what they’ll do. If not, there’s the big lot over by Sam’s. But it’s fun to visit the floats when they’re parked, and marvel at the creativity and hard work that goes into making them. The ninth thing I love about Carnavál? How proud families are that their great-grandmother, their second cousin, or their niece, was queen/child queen or king. It is wonderful multigenerational royalty tradition in this city. During the parades you will see floats with queens celebrating 25 years and 50 years since they were queen. You will see a cable car full of elderly ladies who are queens of their domino clubs or lunch groups. You will see queens who visit us from other countries, to share in our merriment. Tenth? I LOVE the manifestaciónes: the early counting of votes for queen and king, pre-Carnival parades and gatherings. Much more informal than the main event, it is where I was able to get my photo taken with Banda El Recodo a few years ago, when they were Kings of Joy. Confetti, masks, beads, candies, music…. you’ll love the manifestations. And, new the last couple of years has been a callejoneada, or alleyway crawl. While Mazatlán has traditionally had a callejoneada on Day of the Dead, holding one for Carnavál is something, at least to my knowledge, newer. We went last year and it was LOADS of fun. You’ve got to keep your ears open. This event is not nearly as well advertised as the other, more principle events. Twelfth, there is a world class Velada de las Artes, played by an orchestra in the Angela Peralta Theater. If you enjoy classical music, you won’t want to miss it. If you didn’t get your ticket in time, you can still watch it in the Plazuela on one of the outdoor screens, or even over live streaming online. You may be wondering how safe it is to attend the Carnavál events. Our family feels safe, as do thousands of other Mazatlecos. Please use the common sense you would for any major public event. People come to Carnavál from out of town just to pick your pocket, so don’t carry lots of cash or flashy jewelry, or your passport. Also, as with any large crowd, there is always a danger if people get spooked. State Fairs, the Super Bowl, concerts; if people get spooked and start shoving or running, it wreaks havoc. That is not normally the case in Mazatlán, but if it should happen, we’d urge you not to run even if those around you do. Stay calm and help others. Get to the side of a building or a place where you can get out of the flow of people. The greatest danger is losing your footing if there is a mad rush. One final word of advice: if you visit the party zone in Olas Altas on Thursday (King of Joy Coronation) or Saturday (Combate Naval fireworks), plan ahead for your ride home. It is a mob scene. Nearby parking can be scarce, and getting a taxi home can be frustrating, since every one else is trying to hail a cab at the same time. 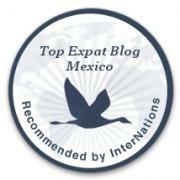 In short, Carnavál Mazatlán has so much to offer that I am sure I have forgotten something. Yes! The ball! On Monday night there is a ball, attended by many of the city’s who’s-who, the international queens, and all manner of visiting dignitaries. You like reserved seats? We’ve got the coronations and the Velada. You like street dancing? We’ve got six nights of the best in the world. You want world-class music? Check. You want black tie? The ball! You want to wear jeans and boots, or shorts and t-shirt? No worries! You want free-of-charge events? Got plenty of those! We look forward to having you share with us one of the world’s best events, the pride of our local Mazatleco community, with over 100 years of respected history and tradition. This is an event we trust will continue for at least 100 more years. What terrific community-building it is! Normally you can’t find all the Carnavál events listed in one place, so below I’ll do my best to help you navigate the maze a bit. The schedule is normally the same every year, though each year the dates change, because Carnavál falls on the days prior to Ash Wednesday (which changes dates year to year). Manifestaciones, usually three of these plus a Final Computation, located at various venues throughout the city. The last one tends to be on Friday night, two weeks before Carnavál, and the parades winds through downtown. Olas Altas is ready to party! Many stages are put up for live music, and there are food and beverage stands galore. Men will usually be frisked as they enter. A small entry fee (30 pesos or so) is charged to enter the party zone. This area is going all night long into the wee hours of the morning. So, if the events below don’t strike your fancy, just head down to Olas Altas and enjoy the party! New this year: Imperio de los Mares, a water fountain and laser light show in the antique oceanside pool in the party zone! To take place at 7:15 and 10:30 each night, this sounds sure to be a spectacular addition to Carnavál. The last few year’s they’ve announced a food fair to take place every day in the Plazuela Machado. This is a major misnomer in English. They do a televised fair opening with the mayor and Carnavál royalty, but other than that it pretty much means the restaurants in the Plazuela will each have a special. Oftentimes their normal menus are actually more limited during the busy-ness of Carnavál. Ash Wednesday: Party’s over! Lent begins! I can see right now I need to bring some of my best party hats to Carnavál. Matt and Cathy, festejones, party on! Wonderful post, you really captured it! Great stuff! It didn't even occur to me planning this trip 2 months ago we'd arrive right in the middle of Carnaval. We'll not arrive in time for the Combate, but Luis (mom and dad too, honestly) is still a bit freaked out from almost getting crushed in a crowd. The tuesday parade is more our scene and looking forward to it. Now if I can just manage a little sleep before our plane ride tomorrow! Rest well and have a safe flight! We'll hopefully be warming things up and calming down the breeze a bit for you here. The unusual weather has put a damper on the new fountain–Imperio de los Mares. But hopefully tonight will rock. The king and floral games fireworks were AMAZING! Just over a week to go – are you as excited as we are??? Here is some info from previous years to help you in 2013 – get ready to party!!!!! Remember this year’s dates are Feb 7 through Feb. 12. 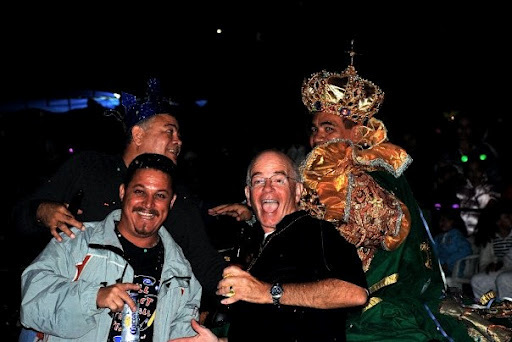 Pingback: Carnaval de Mazatlán 2014 | ¡VidaMaz! Pingback: Annual Schedule for Carnavál de Mazatlán | ¡VidaMaz!